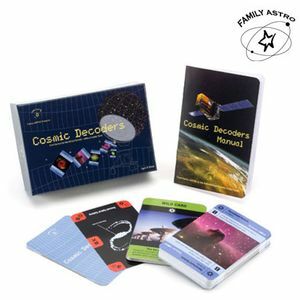 Play four games in one with the new Cosmic Decoders card set from the Society's national family astronomy project, and learn some exciting science along the way! Cosmic Decoders, the take-home activity from Family ASTRO, features a deck of 72 cards with beautiful color images of cosmic objects from the Hubble Space Telescope and other major telescopes in space and around the world. Build A Galaxy: Be the first to build your own galaxy by adding the right kinds of star clusters and nebulae to your Galaxy Builder Card! A second version lets players win by cooperating with another member of their family to form an alliance of linked galaxies. Telescope Trouble: Uncover new "Deep Space Objects" and match their characteristics to the last object played. First person to lay down all their cards wins, but watch out for the telescope cards that spell trouble! Distance Derby: Add as many cards as possible to your own "observing list" of Deep Space Objects. Win by paying attention to how far away from Earth the objects on your cards are. Galactic Gobble: This game is similar to War, where players turn over cards simultaneously and the player with the larger objects "gobbles up" smaller ones. For even more fun, visit the official Cosmic Decoders web site. Take part in a Family ASTRO event. Visit the Family ASTRO web site to see if there is an official location near you.